No single approach to launching an open source ERP Java system fits every company. Even with the best planning and the most productive outcomes, the process takes time, requires a substantial investment, and demands a significant resource commitment. If you select a technology partner that is a great match for your company’s industry, culture, and goals, your outlook for completing a successful implementation becomes much more likely. If you apply the guidelines we present, your probable success rate improves more. 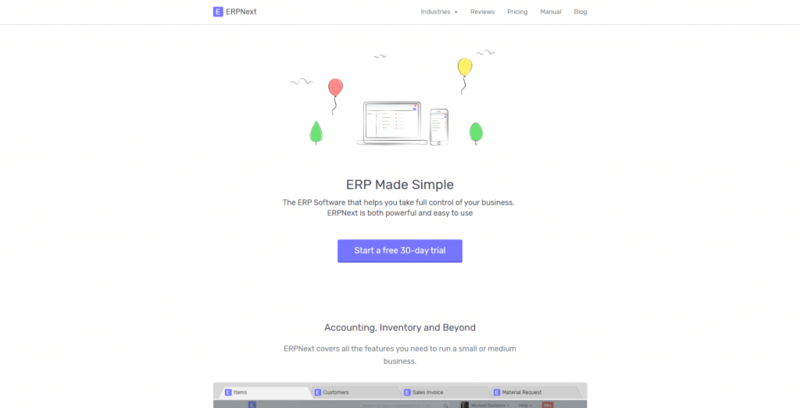 What Is ERP Software? Why Do Companies Need Resource Planning Software? What ERP Modules Should Your Platform Have? A successfully launched platform may deliver production efficiency, improved customer service, and reduced labor costs, no matter what size your company is. It always makes sense to replace a paper calendar or multiple outdated accounting and spreadsheet software programs with a modern integrated system that can store and structure the data flowing. A successfully implemented system can deliver tremendous results and enhance your ability to cut costs, run leaner, and offer high-quality customer service. Here is a simple thing you should know about - a good ERP manages each area of your business efficiently. At the beginning of its development, a typical ERP was a combination of MRP, billing & accounting, and HR management functions. The platforms were able to match inventories, schedule manufacturing operations, track materials and labor, create work orders, and connect manufacturing with other areas of business such as sales, distribution, production monitoring, reporting, etc. With its evolution, ERP system is now able to manage customer relationships, warehouse systems, electronic data interchange, and quality. Before you start looking for the best software, you should define what ERP modules are that your business is lacking with its current system, and use the list of these lacking things as a starting point for your search. Here are some tips on how to choose the platform that best fits your business goals. Choose software suited to your industry or type of manufacturing. Look for the software suited to what your company does. Choose a vendor that knows your industry. You can save a lot of grief if you begin your selection with ERP vendors that have experience with repetitive manufacturing environments such as plastics processing. Ask vendors for references. Choose an ERP system that already has the features you need. When you assess ERP suits you should look at the core features that come integrated into the sticker price, as well as those that can be added on as your company grows. Select an ERP system that is intuitive and easy to use. Once you sat through a sales demonstration for an ERP software system that promises all the features you need, check if it’s possible to jump between different areas. Ease of use should be a primary factor on your ERP evaluation checklist. If you find it hard to use, chances are that other system users will find it hard to use as well. Ask for a guarantee. Some vendors offer a 30- or 60-day guarantee, barely enough to cover the installation time. Demand at least a one-year guarantee. If you don’t see progress on your goals and objectives for the project, don’t be afraid to use the guarantee. Invest in training and consulting. The faster your system users start using the complete capabilities the quicker you will get a return on investment. That’s why you should make sure that each member of your team understands clearly how the software works. Don’t be afraid to ask questions. ERP systems are simple in theory but often complicated in practice. Ask questions if some features or functionalities are unclear to you. The simplest way to get a free ERP is to find an open source software (OSS) that is suited to your business tasks. Let’s figure out what actually an open source is. The software with an open source code is available to users who need a solution to meet a range of goals like managing communications, content, human resources, office automation, etc. They are able to use such systems for free, as is or modified. Users have the right to easily access the source code. They are able to redistribute it freely. to redistribute the code they have modified. When it comes to choosing a free ERP, consider open source. However, you should know that there are some exceptions. While OSS is usually free, check the price of additional options, functionalities, updates, and features. In case you have no experience with OSS, hire a specialist who is able to provide a complete technical support to your open source software. Besides, you should read a completely open source ERP review to know everything about the software of your choosing. Now, when you know what features to look for in your open source ERP Java-based or another technology-based, you are ready to look through our list of top 5 systems we would recommend. Feasibility. The product complies with industry standards, ensures a great base of developers providing support and scalability to meet the needs of the fast-changing markets. Free suit. The software is open to public released under a free license. However, the company offers development and support at affordable prices. Support. The product has a huge community worldwide. 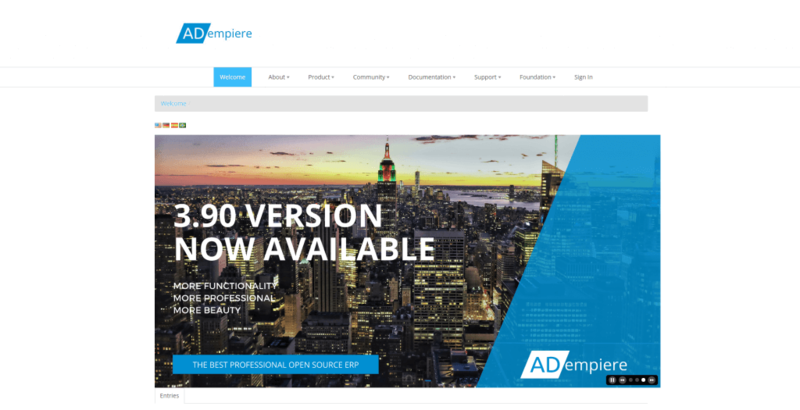 In case you have any issues with use or maintenance, you can contact any of the world’s communities of ADempiere for support. Integration. ADempiere can be easily integrated with other systems. All-in-one solution. Among a great number of features the product offers to its users, you can choose those you actually need and enable them. There are features for sales, HR, finance & billing, products & stock, integration, marketing, and productivity. Support. The product is supported by a great number of tech specialists, developers, and QA engineers. With lots of customers feedbacks, the company is able to implement any innovative changes and enhance the product. Multi-distribution. Dolibarr can be used online, as a standalone app, on a VM, or a dedicated server. It makes the software easy to access from any place and device at any time. Scalability. It is easy to scale the solutions according to your goals and needs. One-stop shop. Odoo offers more than 10,000 applications each of which can meet your specific needs. These apps are simple to integrate with other existing systems of a company. Perfect user experience. With lots of reviews and feedbacks from its customers and users, Odoo has managed to create a user-friendly interface for its apps and enhance its performance so that the Odoo products run faster than other similar apps on the market. Free software. Apache OFBiz is free to use with no upfront rates. Scalability. As the above-mentioned software, this one is also scalable and reliable for meeting any tasks and needs of an organization. Modifications available. Apache OFBiz is completely customizable. Professional support. ERPNext offers support in implementing the system into your organization. Make sure you checked the costs as they offer only a free 30-day trial. Community. ERPNext has a huge community of developers and tech specialists that provide support. Customization. The product’s code is open to modifications and developers friendly. How Not to Fail ERP Implementation? The implementation process doesn’t start with the initial invitation of suppliers to complete tender documents. It begins when a company realizes it needs to upgrade its business management systems and starts defining the objectives of a new ERP solution. These objectives need to connect to your business strategy and be as specific as you can define them. They should be the guiding principles during and after the implementation process. Your current systems, data, and processes set the starting conditions for the success of your ERP implementation. How to Successfully Implement an ERP? When you consider your choice of ERP system, you will find a number of vendors with standardized, widely deployed solutions and suppliers of industry-specific vertical software that might be able to meet many of your needs. While you want to be able to fit your system to your objectives, the more functionality you can obtain from standard solutions, the less complicated it will be to implement, support, and evolve the technology. Again, industry associations, analysts, and your peers are excellent resources. More than likely, best practices and innovative ways to address your business challenges already exist and have been proven in real-life business scenarios. Smart due diligence can help you find them. As regards the selection of a technology partner to provide and deploy the system, experience shows that a number of basic steps and questions can help you ascertain the best fit and the ability of a company to deliver the solution you want. Here are some recommendations from our top managers on how to choose a reliable partner. Check out the references - References demonstrate real-life results. Documented success stories and case studies show how experienced your potential providers are. Look for business expertise - To custom build an ERP system, your technology partner must have a strong background in the business you operate in. Ask your potential vendor about the industries they served. In our company, for instance, we have professional business analysts in staff who are highly experienced in different industries as well as in software development best practices. Ask about the support options - After your product goes live, you must be sure that it will be properly supported at any time you need. A lot of technology companies offer live chats, 24/7 technical support from a devoted team, self-service, etc. Our tech specialists or project managers can visit you in case you need some specific help. Look at your vendor’s culture - Check if your partner’s business culture dovetails with yours. This may include the culture of communication, documentation management styles, level of formality, etc. Think of future innovations - Make sure that your technology partner is solution-focused rather than product-based. In the future, you will need to continuously innovate, make some changes, and upgrade your ERP system to move with the times. To adequately manage your budget you need to learn the real costs of getting, implementing, and operating an ERP app. Some of the prices may not be obvious. Likely costs together with licenses include consulting, deployment services, training, organizational change management, design and custom development, support, and maintenance. If you make up your mind to migrate to the cloud, the price may be comparatively low, but you will definitely need to plan and budget for deployment, hosting, ongoing support and improvements, training, change management, and custom modifications. Both on-premise and cloud deployments of new software may require updates to the current system or integrations between the developed product and existing technologies. In case open source or cloud solutions don’t match with your needs, and you think of a custom ERP, feel free to get some useful recommendations from us.